The 7 minute workout has become a rage now. There are a plethora of training programs and mobile apps helping people get a good workout in a very short amount of time no matter where they are. The seven minute workout is claimed to be the safest, most effective and most efficient way to improve your muscular and aerobic fitness, and thus, make you healthier. The workout started grabbing eyeballs when it was first published in the American College of Sports Medicine’s Health & Fitness Journal. But when authoritative magazines like the New York Times, Business Insider and Forbes started writing about it and swearing by the results, the authenticity of the workout was validated. 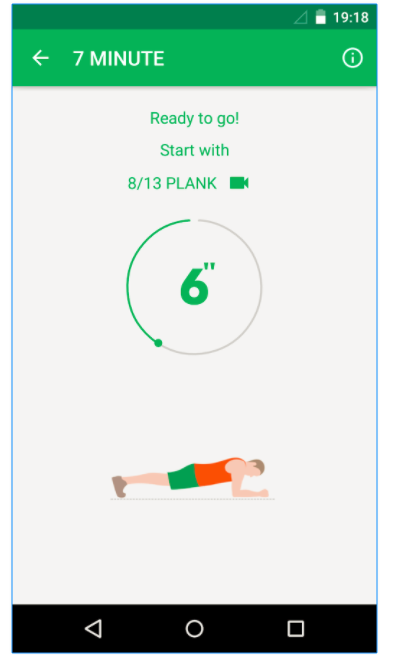 To take it one step further, The New York Times also launched a 7 minute workout app offering animated illustrations of the exercises and with its 2 variations, namely, the scientific 7 minute workout and the advanced 7 minute workout.. The 7 minute workout basically involves 12 different bodyweight workouts, with each workout lasting 30 seconds. You will be expected to do the exercises with very brief rest periods in between (preferably 10 seconds) and complete the circuit. A high-intensity, minimal rest circuit takes about 7 minutes and you can choose to repeat the circuit based on the energy and time you have. The best part about the workout is its accessibility. The 7 minute workout eliminates the dependency on strength training equipments as it involves body weight for resistance. All you need is a chair or a bench, a wall and the will to exercise. The workout originated as a means to meet the demands of today’s time-constrained society. The 7 minute workout is a combination of aerobic exercises and resistance training packed in a short time interval resulting in a high intensity, limited rest workout. This form of workout is often referred to as HICT (High Intensity Circuit Training). According to science, targeting multiple large muscle groups, with very little rest between the sets promotes aerobic and metabolic benefits. Research claims that these benefits can be present in our body for up to 72 hours after completing the high-intensity workout. The scientific 7 minute workout also helps to lose excess body fat and helps with weight-loss. High-intensity Circuit Training is found to have better effect on the body when compared to traditional steady state long workout routines. 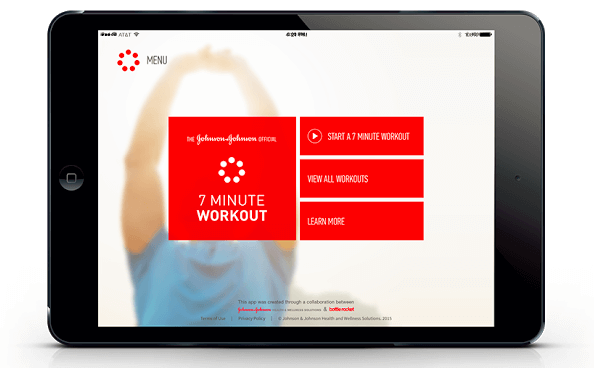 There are many versions of the 7 minute workout which can be accessed through apps on mobile devices. The apps involve animated characters demonstrating the workout with audio and time tracking features. Basically each app consists of 12 basic exercises and their variations. This is a welcome feature because following the same workout every day can be challenging. We humans need variety in everything we do. Mobile apps not only promote the 7 minute workout, but also help to strengthen your commitment by helping you to track your progress. However, if you search for 7 minute workout mobile apps, you’ll find dozens of them. So, how do you choose the best ones? Don’t worry, we’ve got that covered for you. To eliminate the trial and error, here is a carefully curated list of 7 apps that will give you the best workout experience. 1. 7 Minutes Workout by Simple Design Ltd.
I’ve personally been using this app for over a month now and am totally in love with it. The app already has over 3 million users and ranks among top health apps. Along with giving you a good 7 minute, it also offers an ab workout routine to strengthen your core and achieve your goal of having six pack abs. Also, the 30 day workout challenge and the daily reminders (based on the time you set) will help you stay accountable to your workout goals. An animated trainer will guide you through different workouts along with audio support.The app includes features like google fit support, voice guidance, adjustable circuit and rest time and workout logs which show you your complete workout time. The app adjusts the workout intensity based on your capacity and progress. The workouts get more and more challenging with time. Simple designs also offers a pro version of the app with additional workout routines for a minimal payment. The app is only available for android devices at the moment. This amazing app starts with the premise of encouraging you to Workout every day for 7 months. Skip a day and you lose one heart. This game-like experience is exciting and makes you look forward to your next workout routine. Every month the hearts lost (if any) will be replaced. Losing all the hearts will reset your progress and you’ll have to start the challenge all over again. The app has an excellent user interface that guides you through certain customization options to tailor the workout to your needs. This gives the feel of having an actual trainer telling us what to do. You will be given rewards based on achievement which you can proudly share with your friends. The workouts can be customized to suit your daily needs. With different workout variations, plans and categories, you will definitely love this multifaceted app. The Seven app is available to both Android and iOS devices. The workout is Designed by Chris Jordan, director of Exercise Physiology at the Johnson & Johnson Human Performance Institute. The app has 72 exercises in total and 22 additional workouts that can be customized and modified to create more than 1000 variations. You can either stick to the original 7-minute workout or swap workouts to include variety. 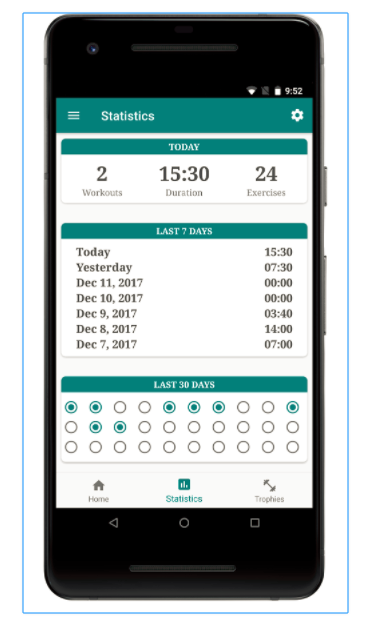 It has a unique feature called the smart workout which recommends different workout programs by gauging your fitness and motivation levels. The training videos are personalized, with Chris Jordan demonstrating the correct way to do each exercise. This personalized workout experience is available on apple watch so that it always stays with you. 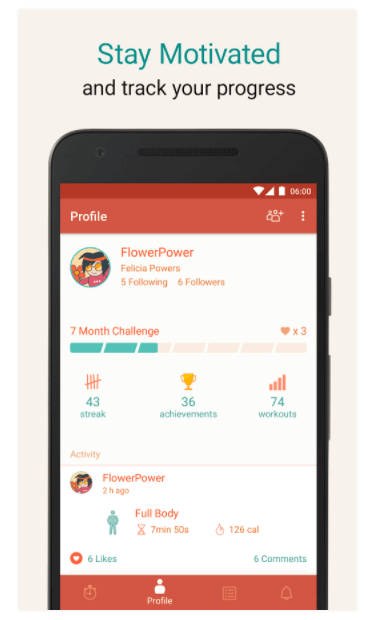 As with other apps, you can track your progress by analyzing the number of workouts and number of cycles, and share the screenshot with your friends. Having this app in your toolbox is like carrying a personalized gym along with you everywhere you go and can be accessed on all Android and iOS devices. This app consists of a slightly more intense variation of the scientific high-intensity interval training 7 minute workout routine. The app uses an animated robot like character to demonstrate the workouts (which I adore!) and has time tracking and audio features. A dumbbell symbol will be displayed on the screen if the workout resistance can be increased by incorporating a dumbbell. The app consists of a pre-workout warm-up, upper body fitness workout, lower body fitness workout, abs fitness workout, strength fitness workout, cardio fitness workout, Random fitness workout and the classic scientific 7 minute workout. You can do a single routine or stack up to break more sweat. As with other apps, it also includes basic features like sync to google fit, earning trophies, and sharing progress with friends. Currently available for Android devices only. 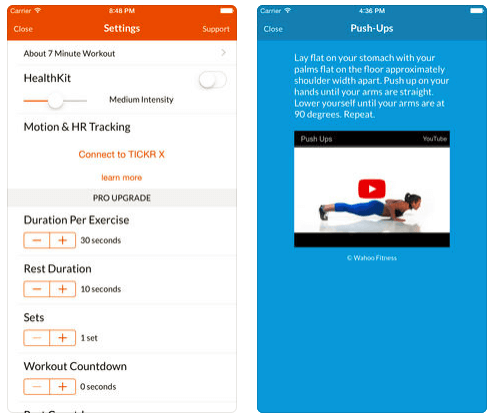 This app is Featured by Apple in the best “Apps for Health” and Lifehacker chose 7 Minute Workout in “The Best Apps That Integrate With iOS 8’s HealthKit“. It contains simple daily workouts. The app solely depends on guiding the users with audio support as there are no ongoing video demonstrations. To check the video, you’ll have to watch it in a separate session and then do the exercises. 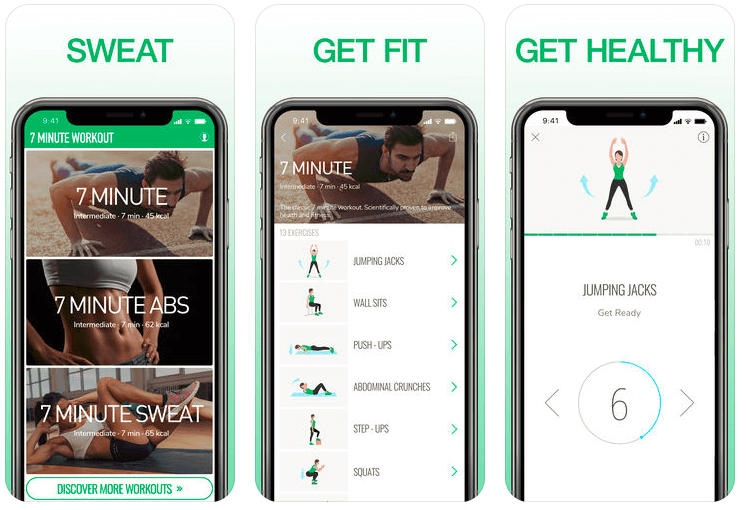 You can upgrade the app by paying $1.99 and access other features like setting the duration for exercises and rest periods, randomize the exercises and to unlock alternate workouts. Available for both Android and iOS. Serving complete justice to the original 7 minute workout, this app includes short and effective workouts. The workouts are beginner friendly and easy to perform. The app also includes other basic features like video and voice instructions. Since I was more into strength training and cardio, when I first heard about the 7 minute workout, I couldn’t help but laugh at it. Gradually with increased priorities, sparing that one hour to visit the gym became challenging. That was when I got into the “something is better than nothing” mindset and started with the seven minute workout training program. I also wanted to check if it actually lives up to the expectations. I must admit that it does! I totally loved it and wished i could’ve started it earlier. The workout sometimes takes more than seven minutes for me, but once I’m done, I’m gasping for breath and my entire body feels charged! 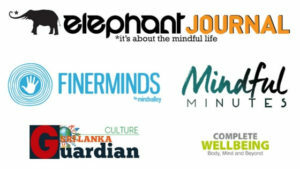 2 weeks into the program, i started noticing considerable changes in my body and energy levels. I looked more toned and the excess fat was slowly disappearing. Engaging in a high intensity full body workout everyday strengthened my core and rid me of my long enduring lower back pain. My endurance increased and I could easily go through the day without feeling fatigued. And, I experienced all these benefits with only 7 minutes a day. If this doesn’t excite you i don’t know what will. Do yourself a favour and download a 7 minute workout app. Combined with healthy eating, this is the best habit you can cultivate this year for your health.